I get to see Dr. Schleich's talk on his gravitational red shift vs. gravitational accelerometer calculation with respect to the KC interferometer, (picture 1), . The authors of KC interferometer experiment claimed that it measured the gravitational redshift, or time dilation due to curved space time. In his PRL paper, Dr. Schelich points out that by analyzing the KC interferometer by looking at the commutators of it's time evolution operators, one can avoid choosing a representation and show that the shift in phase of the atoms in the KC interferometer is due to the acceleration of the atom caused by the gravitational potential, and not due to the gravitational red shift. +Jonah Miller does a great job of describing the gravitational redshift. Dr. Greenberger points out, (did I mention that this article is really, really good?) that the gravitational redshift and the twin paradox are two sides of the same coin. You can check out my recent meanderings on the twin paradox inspired by Brian Green's explanation. The neturon interferometer can also be used to look at the gravitational Aharanov-Bohm effect. For more information on this, once again check out , there are also more references pointed out here. Finally, an interesting bit of trivia I hadn't realized. 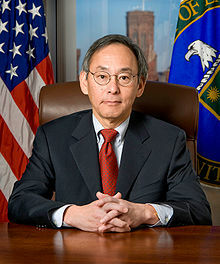 The C in the KC interferometer is Steven Chu, the United States Secretary of Energy, (picture 2). References follow.